I am pleased to relay that the Board of Trustees of Illinois Institute of Technology recently announced that Dr. John L. Anderson, currently provost of Case Western Reserve University, will be the eighth president of IIT. A Wilmington, Delaware native, Anderson has served as provost of Case Western in Ohio since 2004. Prior to that, he served for 28 years at Carnegie Mellon University in Pennsylvania, including eight years as dean of the College of Engineering. Anderson received his bachelor's of chemical engineering degree from the University of Delaware and his master's and Ph.D. in chemical engineering from the University of Illinois at Urbana-Champaign. He served on the faculty of Cornell University in New York for five years before joining the faculty at Carnegie Mellon. Anderson will assume his duties on August 1, 2007. On a personal level, I will miss working with Lew Collens who, as many of you know, served for the last seventeen years as President of IIT after his sixteen-year deanship here. I know how justifiably proud Lew has always been of the tremendous growth of this school. 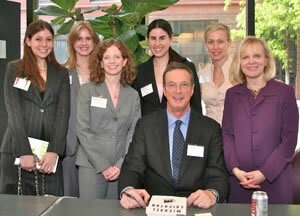 We honored Lew at commencement, and will do so again at our alumni luncheon on December 5, 2007. At the same time, I look forward to getting to know John and being part of the team that will help launch IIT to further national prominence. And, with Lew’s return to the law school as a professor, the law school has already become stronger! Thank you so much for your continued support of Chicago-Kent. We look forward to seeing you at our upcoming events. Every year Chicago-Kent alumni from across the years come together to honor distinguished alumni and individuals who serve Chicago-Kent and the legal community. Please save December 5, 2007 for our 30th Annual Alumni Luncheon. It is sure to be a well attended and meaningful event. This year’s luncheon is especially poignant as we bid farewell to retiring IIT President Lew Collens, former Dean of Chicago-Kent from 1974 to 1990. Details and sponsorship opportunities will be posted online soon. This year’s Commencement ceremony took place once again at the Arie Crown Theatre, McCormick Place on Sunday, May 20th, 2007. The Class of 2007 included 67 Master of Law recipients and 365 Juris Doctor recipients. Justice Anne M. Burke '83 gave the keynote address, while Valedictorian John Greifzu ’07 was the class speaker. 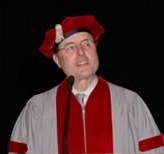 Dean Hal Krent conferred an honorary Juris Doctor degree on retiring IIT President Lew Collens, honoring his extraordinary 33 years of leadership at the helm both of IIT and Chicago-Kent. If you missed the Commencement ceremony, you are welcome to view the video online. Photos from the ceremony and reception can be viewed on the Alumni Online Community. The conference, sponsored by the Institute for Science, Law and Technology (ISLAT) at Chicago-Kent, brought together academics and legal professionals from all over the U.S. and Canada to discuss current laws, proposed legislation, and other policy solutions to issues like disputes over body tissues, intellectual property and gene patents, and more. Director of the Institute for Science, Law, and Technology, Lori Andrews, and Chicago-Kent Dean Harold Krent were among the speakers. Jessica Rissman, Danielle Bochneak, Julie Burger '00, Rachel Greene, Laurie Rosenow '99, and Professor Lori Andrews, ISALT Director. The American Bar Foundation (ABF) has selected Professor Bernadette Atuahene for a three-year Faculty Fellowship, following on the heels of her successful visitorship with the ABF this past fall. Professors Dan Hamilton and Carolyn Shapiro have been named Faculty Visitors for the coming year. The ABF is a nonprofit, independent, national research institute committed to basic empirical research on law and legal institutions. Its program of socio-legal research is conducted by an interdisciplinary staff of 22 Research Fellows and Faculty Fellows trained in such diverse fields as law, sociology, psychology, political science, economics, history, and anthropology. The respective fellowship and visitorships represent both an honor and an excellent research opportunity for Professors Atuahene, Hamilton, and Shapiro. Alumni and friends in the metro New York area joined Dean Krent Tuesday, June 12th for an Italian dinner at Grano Trattoria in the West Village. Professor Lori Andrews was also on hand, having led a discussion of her most recent novel Sequence earlier in the evening at Partners in Crime bookstore near the restaurant. Dean Krent provided an update on the law school and answered questions from attendees. New connections were made as graduates met other alumni from the 70’s, 80’s and 90’s and classmates brought each other up-to-date on their careers and personal news. 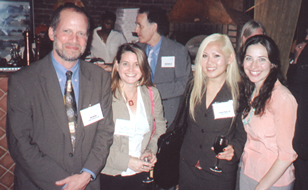 Dean Krent with (l-r) Hillary Frommer '98, Elayna Pham '99, and Jennifer Rubin '03 at Grano Trattoria. The Library welcomes alumni to visit and use the collection throughout the year, except during the fall & spring final examination periods when the Library has restricted access. Alumni are also welcome to use the Library's reference services. A professional librarian can help answer your general reference questions by phone at 312-906-5670, by email at refreq@kentlaw.edu, through instant messaging, or in person at the Reference Desk. Please remember that librarians cannot provide legal advice. The Library’s website contains valuable information such as the Library’s hours, maps of the different floors, and the online catalog. If you need to know whether the Library has a particular book or journal, you may search the online catalog, or ask the Reference Desk. If you have any questions about the Library or any of its services, please contact Keith Ann Stiverson, Library Director at: 312-906-5610 or Holly Lakatos, Director of Public Services at: 312-906-5690. The Small Business Law Workshop is being offered by the Small Business Program at the Law Offices of Chicago-Kent College of Law. This workshop is free of charge and open to the public. Learn key information about various business entity types, including the pros and cons of sole proprietorships, partnerships, limited liability companies, S corporations, and C corporations. Learn how to spot important legal risks and valuable opportunities common to small businesses. To register, call (312) 906-5045 or visit www.jdeas.com/workshop.htm. For more information, visit the Small Business Program website at www.jdeas.com. Chicago-Kent returns to the North-side this season as we host our annual alumni baseball outing at Wrigley Field. The fun starts with dinner and drinks at Goose Island Brewery in Wrigleyville. Then, join us as the Chicago Cubs take on the Philadelphia Phillies for a 7:05 p.m. Game. Dinner and Drinks: 5:30 p.m. Please RSVP by July 27th or sooner – Tickets will go quickly! Click here to purchase your tickets online or call (312) 906-5240. Invitations will be mailed in early July to members of the Senior Partner Council. The Senior Partner Council represents the core group of alumni and friends contributing leadership gifts of $1,000 or more annually (or $500 annually for alumni from 1997 or later) to Chicago-Kent. Senior Partner Council members enjoy invitations to special events, special reports from the Dean, and recognition in the annual Dean's Report. For more information about the Senior Partner Council, please contact Mark Boeck at (312) 906-5236. Chicago-Kent College of Law presents the 18th annual Henry Morris Lecture in International and Comparative Law The lecture is free and open to the public. No registration is required. For more information please call (312) 906-5090 or visit www.kentlaw.edu/depts/cle.